When Cliff Lee left Texas to sign with the Philadelphia Phillies in the winter, the Rangers’ front office knew their quest to defend the American League pennant had become that much more difficult with a weakened starting rotation. This year though, Texas has gotten good production from their starters, ranking sixth in the majors with a 3.50 ERA. Pleasant surprises in the back end of its rotation from Alexei Ogando (20 starts, 10-5, 2.88 ERA, 1.040 WHIP, 93 strikeouts in 125 innings) and Matt Harrison (20 starts, 9-7, 2.94 ERA, 1.245 WHIP, 80 strikeouts in 125.1 innings) have helped make up for the loss of Lee. However, with the Rangers only two games up on the Los Angeles Angels of Anaheim in the AL West, Texas general manager Jon Daniels knew he had to be aggressive to give his team’s pitching a lift heading into the stretch run of the season. With no frontline starters on the market this year, unlike when the Rangers acquired Cliff Lee last July, Daniels turned his eye on solidifying a bullpen that ranked 26th in baseball with a 4.35 ERA. 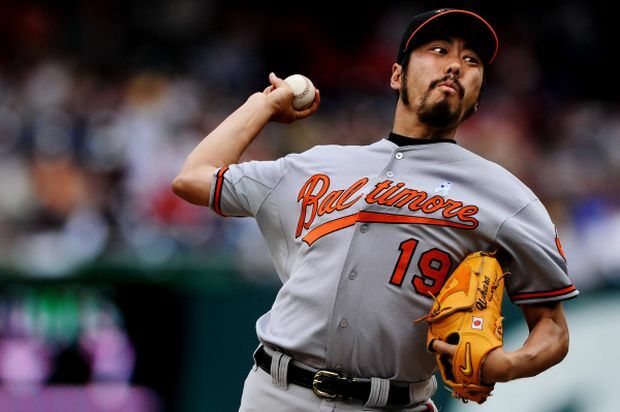 He came away with the two best set-up men on the market, dealing pitching prospects Robbie Erlin and Joe Wieland for the Padres’ Mike Adams, and sending first baseman Chris Davis and pitcher Tommy Hunter to the Orioles for Koji Uehara. The price was high in both deals, especially Erlin, who was Texas’ fourth-best prospect. However, in return, the Rangers now have two relievers who have combined to throw 96 innings, allowing only 15 earned runs (1.41 ERA) on 51 hits while punching out 113 and walking only 17 batters. By dealing for Adams and Uehara, respectively, the Rangers effectively make the game into virtually a six-inning affair. If a Texas starter can get through six innings, Rangers manager Ron Washington can turn to a combination of Uehara, Adams, Yoshinori Tateyama (24 games, 1-0, 3.20 ERA, 0.908 WHIP, 27 strikeouts in 25.1 innings) and lefthander Darren Oliver (40 games, 3-5, 2.23 ERA, 1.101 WHIP, 31 strikeouts in 36.1 innings) for the seventh and eighth innings before closer Neftali Feliz (40 games, 0-2, 3.26 ERA, 21 saves, 1.267 WHIP, 27 strikeouts in 38.1 innings) takes over for the ninth. With no starting pitchers able to go at least seven innings in every single start like Lee was capable of, a struggling bullpen was something Jon Daniels needed to address this trade deadline. The additions of Mike Adams and Koji Uehara instantly provides depth and improves the bullpen to one of the strengths on the team. Their presence should ease the pressure on Texas’ starters, who often had to pitch deeper into games than they would have liked due to an unreliable group of relievers. Combined with Oliver and Tateyama, the Rangers now have one of the deepest and most formidable group of set-up men in baseball to bring the game into Neftali Feliz’s hands in the ninth. The Rangers were not able to acquire a top-of-the-line starting pitcher this July. However, by bringing in Adams and Uehara, Texas will be able to turn out the lights and make games turn into a six-inning affair. This entry was posted on August 1, 2011 by Scott Kornberg. It was filed under Koji Uehara, Mike Adams, Texas Rangers and was tagged with Alexei Ogando, Darren Oliver, Koji Uehara, Matt Harrison, Mike Adams, Neftali Feliz, Rangers, Rangers bullpen, Ron Washington, Scott Kornberg, texas rangers, Yoshinori Tateyama.